Crafting on the go? 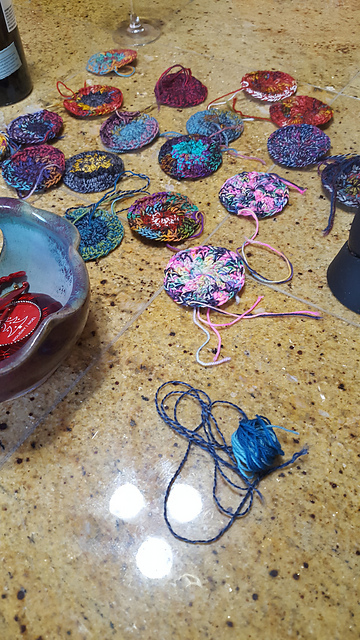 Serious crafting on the go? With artisan results? History? And a warm blanket at the end of it all? For several years, I've admired pictures of English paper piecing in progress. I wasn't considering getting into it, though. I've been knitting in earnest for years, and if my hands are moving, isn't it usually because I have yarn in them? So I didn't think I'd have time to take on a new project. I'm a Knitter! But I'm a Knitter who wants blankets and knitted blankets take forever. For-ev-er. I give you my mitered squares blanket that I've been working on for 8 years, and which is still not even halfway finished. 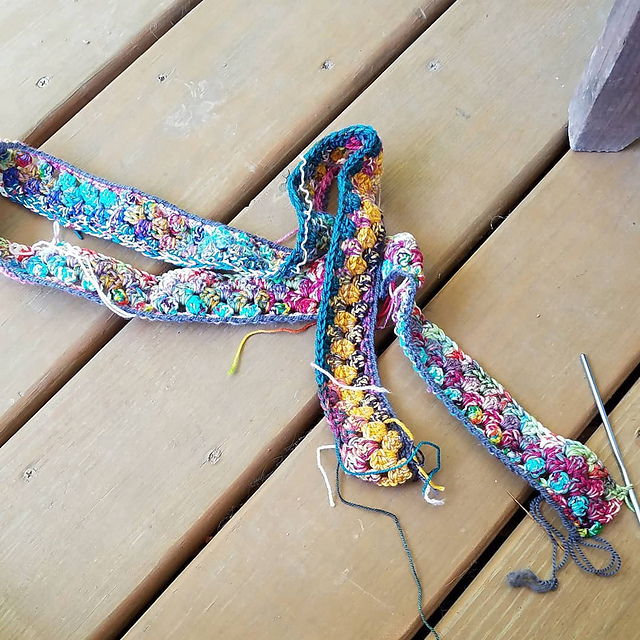 I've also tried crocheting blankets from leftover yarns from knitting projects. I have two in some stage of progress or other. And then... just before Christmas I got this crazy idea. Why not take up EPP? 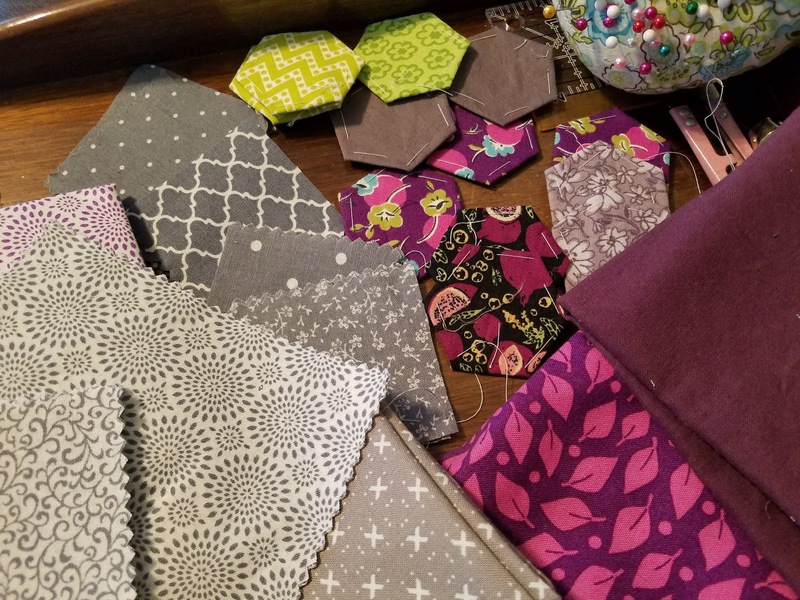 There were sales on Christmas fabrics and quilting notions. I could have a blanket or two done by next year and won't that be amazing? Maybe a smaller project would be in order to see if I actually even LIKED it. I made some coasters for my sister in law using a tutorial I can't seem to locate anymore. Not perfect, but cute. 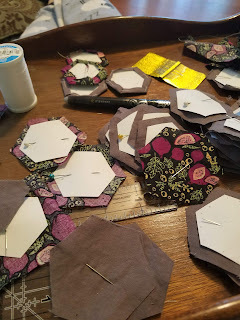 And I became a hexagon addict. I'm buying up fat quarters and pre-cuts in grays and purples with the idea of making a ripple blanket of hexagons. 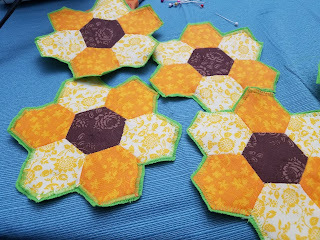 I'm about 150 hexies in now. Aren't these purples so pretty? And aren't these grays so elegant? And the pops of green so fun? Links to sites and videos that I found really helpful for getting started (there are a bazillion of videos out there with almost exactly the same information... my favorite had excellent tips for efficiency). Best video I found for making life easy and keeping things efficient with the basting and sewing together of hexagons, etc. For figuring out quilt sizes-- a handy guide.